Another Colleen Hoover masterpiece. I just finished reading Hopeless a few hours ago and it has yet to sink in. I have no idea how Colleen comes up with these awesome stories. I loved her first two novels Slammed and Point of Retreat. In fact, I loved it so much I ended up ordering paperbacks even though I've read them already as ebooks. And I'm definitely getting Hopeless in paperback once it's available as well. I have to give my good friend and fellow blogger, Jona, credit for introducing me to Colleen Hoover and her novels btw. To start with the novel's main character is called Sky. A 17 year old girl who was adopted and knows nothing about her past. She's lived her life by being stoic most of the time and could easily be mistaken for someone who is emotionally impaired. Honestly, it was so difficult for me to think of the way she has been living her life for years. I didn't even know if I wanted to be like her or pity her. Let's all face it there comes a time in our lives when we just want to feel nothing because everything just seems to hurt too much. Anyway, I love the fact that she was able to overcome her hurdles as the story progressed. I wanted to hug her every time she discovers something awful about her past. I do love Sky. I love the development of the story and I love the fact that after everything that she's been through that she has managed to grow up and go on with her life. And of course, Colleen's novel wouldn't be complete without the oh so yummy Holder. I think I just found my soul mate. This guy is everything a girl could ever ask for. I just love everything about Holder. His intensity. His temperaments. His brutish and gentle ways. I just love everything about him. I love the fact that he was there for Sky the entire time she felt so hopeless. No pun intended. I love the way he knew how to handle or take care of her. He knew when he should be gentle and when he should just be rough. I just love a guy who knows what a girl needs even if he is broken himself. Overall, I loved this novel as much as Slammed and Point of Retreat. I'm not comparing them since honestly, there is nothing compare. They're completely different from each other. What I do know is I love Colleen Hoover's writing style. It's the way she comes up with these lines that could melt the Ice Queen's heart. I'm telling you if Colleen were a guy then ladies be prepared to be swept off your feet. I love Hopeless.It made me feel a lot of emotions that I didn't even know I was capable of feeling. I felt like I was riding a roller coaster the entire time I was reading and I loved it. Believe me, that is saying a lot. I'm terrified of roller coasters. I cried. I laughed. I swooned. I really felt all the high's and low's of the entire story. It wasn't just a sappy love story between two teenagers who wanted a real relationship. It was about coping and making things right despite the fact that everything is just so messed up. The message the novel conveyed is so powerful I needed a few hours to let it all sink in. Anyway, I'm definitely getting myself a paperback of this one as soon as possible. I'd give this a 10/5 star rating if it were possible but alas, only 5/5 stars can be given. I might actually love this a little bit more than Slammed and Point of Retreat. 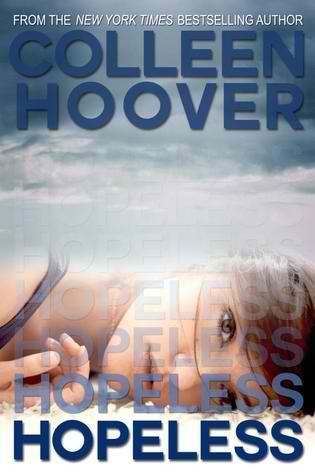 Sky sounds great, and I have heard good things about Hoover, but haven't read any of her books yet. She's an awesome author. I hope you do get to read her books. They're amazing. Thanks or dropping by.